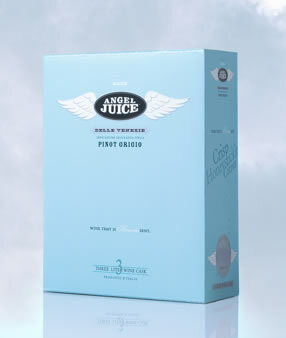 Angel Juice Pinot Grigio is appropriately named – it’s a mild, pleasant wine that some will think is heaven-sent. (After I wrote that line, I found that the winemaker had put similar wording on the box…) The nose is floral with some woody notes and a hint of clove. On the palate, the wine is light-bodied and delicate, with pear, melon and citrus leading into a slightly acidic finish. Overall, Angel Juice is a delicate, dry, and refreshing wine that can be enjoyed at any time but might be particularly fun at outdoor summer parties, both for general quaffing and to accompany lighter fare like salads and fruit. This entry was posted in Box Wines, Pinot Grigio, White Wines, Wine Reviews on March 2, 2007 by Roger. Golden Gate Pinot Grigio is a non-vintage California wine priced in the Two Buck Chuck range. Surprisingly, it’s not all bad. The mild nose has weak notes of spicy apple. The wine is light bodied, with grapefruit/citrus predominating with a bit of apple and pear. There’s a bit of acidity in the finish, but not a lot. It’s a light, refreshing wine that would go well with fruit or mild fish dishes. Golden State Vineyards is a major wine maker, but the vast majority of their production is sold in bulk to other companies. For the price, this wine is quite drinkable. If your budget is severely limited, or if you have to serve a lot of wine without spending a lot of money, give Golden Gate Pinot Grigio a try. This entry was posted in Pinot Grigio, White Wines, Wine Reviews on November 11, 2006 by Roger. We love to attend wine tastings, as they let us sample a range of wines in the space of an hour or two, without having to commit to buying and consuming a bottle of something that turns out to be not to our liking. The Vine & Spirits hosted one the other night, with a slightly unusual approach. While normally such tastings showcase the range of wines from one or several vineyards, this tasting night contrasted the offerings of different brands in four varietals: Riesling, Pinot Grigio, Pinot Noir, and Zinfandel. With three wines in each category, the taster could compare and contrast the different characters of each wine. This wonderfully practical approach is often superseded by the necessity of meeting the needs of a sponsor, but in this case it was an enjoyable change from the ordinary. These included a Yalumba “Y” Series Riesling from Murray River, Australia, a Kiona White Riesling form Washington, and a Black Star Farms Late Harvest Riesling from Michigan. We didn’t keep notes on these, but the Kiona White was easily the sweetest, almost a dessert wine in character. These were Cantina Torlano Pino Grigio from Alto Adige, Italy; Torre Di Luna Pinot Grigio from Trentino, Italy, and Cantina Lavis Pinot Grigio IGT (Trentino, Italy). The Torre Di Luna wine seemed a bit more acidic, but not in a bad way. The Castle Rock Pinot Noir from Mendocino, California had a mild plummy flavor with a little spice. The first wine from Tasmania that I can recall tasting was Tamar Ridge Pinot Noir Devil’s Corner; this wine was rather thin, with quite a bit of pepper and acidity, but more mineral than fruit. My favorite of the group was the Babich Pinot Noir from New Zealand; it had quite a bit of body with a good mix of cherry/berry notes and pepper. The most unusually named wine of the night was Gravity Hills Tumbling Tractor Zinfandel (Paso Robles), supposedly named for an incident in which a tractor slid down the steep hillside of the vineyard. This zin had a plummy start, and a dry, peppery finish. The Graziano Zinfandel from Mendocino, California had a big, bold flavor; it was fruity, almost slightly sweet as it hit the palate, but complexity and spice increased quickly, leading into a woody finish. My favorite from the group was Schuetz Oles So Zin, a California wine that was full bodied and showed a nice balance of cherry and spice from start to finish. At the end of the evening, I ended up taking home some of the Babich Pinot Noir and the Schuetz Oles So Zin, my two favorites of the night. Kudos to The Vine and Spirits for hosting an interesting tasting event organized by varietal rather than the more typical brand arrangement. This entry was posted in Pinot Grigio, Pinot Noir, Red Wines, Riesling, Wine Reviews, Zinfandel on August 26, 2006 by Roger. The packaging of Voga Pinot Grigio 2004 caught our attention. Unlike virtually every other wine bottle on the shelf, Voga’s 2004 bottle is a perfect cylinder, with a large vertical logo imprinted on the bottle. Even the closure, which is a bottle neck that accepts a standard cork, is camouflaged by a black plastic cover that matches the diameter of the bottle to extend the cylindrical appearance. The black top on the clear, golden bottle makes a dramatic statement. In this Voga bottle, Italy once again shows why it is a leading source of product design expertise. The Pinot Grigio itself is a pleasant enough wine. Its aroma has strong apple and melon notes, augmented by mint and citrus. The flavor is a mild mix of lemon and cantaloupe. The finish is brief and refreshing. As one might expect, the unique Voga bottle has attracted some attention, not to mention the wine itself. WineWaves scored it at 87.5, and said “The mouthfeel is light and quite tart. Lemony, minerally (almost salty) flavors lead to a crisp palate cleansing finish.” The same blog also found the 2005 vintage, and found the packaging improved and the wine still likable. This entry was posted in Pinot Grigio, White Wines, Wine Reviews on July 9, 2006 by Roger. For a staple of supermarkets and convenience stores, Beringer Pinot Grigio (2004) is a pleasant surprise. It has a melony aroma, and tastes of apple, melon, and citrus. Its flavor is crisp and slightly tart, and its finish lingers on the tongue pleasantly. It’s not as dry as some Pinot Grigios, and will appeal to neophyte wine drinkers more than some more refined examples of that varietal. You won’t impress your guests with the Beringer label, but this wine makes an exceptionally affordable (we found it on sale for a rock-bottom $4.50) accompaniment for lighter foods, and for those guests who prefer a white wine under any circumstances. Beringer makes a number of Pinot Grigios, including Founders Estate and Stone Cellars; this one, simply dubbed California Pinot Grigio, is the least expensive of the group. This entry was posted in Pinot Grigio, White Wines, Wine Reviews on December 19, 2005 by Roger.